The second Czech – Slovak Conference titled “Inspirujme se…otevřeností” (“Let’s inspire…by open data”) was held at the Hotel Tatra , Bratislava, Slovakia on 27 and 28 November 2013. The event attracted a large number of participants and was organized thanks to the cooperation of CENIA (Czech Environmental Information Agency) the Slovak Environment Agency and the support of environment ministries of both countries. 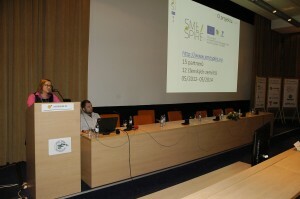 The event was closed by the smeSpire project workshop, aimed to introduce some of the project results after a year and a half of its duration. The workshop was opened by the presentation of some information from the final report about INSPIRE and business activities of SMEs in project partners’ countries . It was presented e.g. how big (or rather small) are these SMEs, as well as who are their key customers, what strengths and weaknesses of INSPIRE the SMEs identify etc. ; followed by on line presentation of the project components: database of SMEs, training materials and work the best practice catalogue (an example of one BPC record in detail).